1. 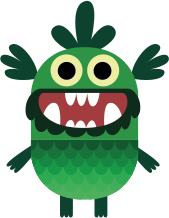 Launch Google Chrome as you would normally, navigate to Teach Your Monster To Read and attempt to open the game. You will see the blank screen where the game usually is, and possibly a message like: "The web browser you are using isn't supported. Try in a different web browser or enable Flash"
2. After you receive the error message, click on 'Secure' (it's usually in the upper right hand corner of the navigation bar). 3. From here, find 'Flash' in the dropdown menu and set 'Flash' to 'Allow'. You might have to click on a setting cog named 'Site settings' first, and then locate Flash in the list of settings. 4. 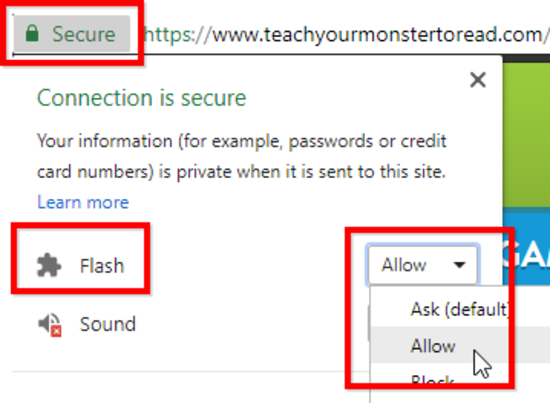 You can then navigate back to the teachyourmonstertoread.com web page. 5. There should be a bar across the top of the web page, saying 'To apply your updated settings, reload this page'. Tap the 'reload' button. 6. The game should now load correctly. PS - We will be moving most of our main games and content to HTML5 shortly, so this issue shouldn't prevail. 1. Your web browser isn't supporting HTML5. Try using a different web browser, like Google Chrome or Microsoft Edge. Our game does not support IE 11 (Internet Explorer 11). 2. You don't have Flash installed OR Flash is installed, but your web browser is blocking it. First, try using a different web browser, like Google Chrome or Microsoft Edge. If the above doesn't work, ensure Flash is installed. If it's not, then install Flash. Then ensure Flash is enabled in your web browser settings. Enable in Safari, enable in Chrome, enable in Firefox, enable in Edge or enable in Internet Explorer. 3. You're trying to play the web version of our game on a phone or tablet. If you want to enjoy the game on a phone or tablet, then please download our app from iTunes, Google Play Store or Amazon app store. You can get a new password here. If that doesn't work for some reason, please get in touch. This sometimes happens if the browser doesn't have enough space to show the game. Try ‘zooming out’ on your browser, or hiding some of the toolbars at the top of your browser window. The most likely problem is that your school network is not allowing access to the game file. Find out more about the blank screen problem. 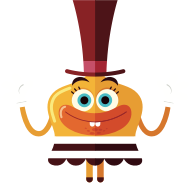 Teach Your Monster to Read has a practice mode on the app, and you also have the option to play with specific letters and sounds via our Monster minigames and Digital flashcards on web. What's more, at the end of Level 2 and 3, once the player has completed the level, they can then go back and replay specific parts of this level. This section is called the 'Word Universe'. Please contact us giving as detailed a description as possible of what the problem is. Screenshots and videos help! We'll be back in touch as soon as possible to see if we can help.